Safari Beats Musical Toy is rated 1.7 out of 5 by 7. What’s music to mom and dad’s ears? Baby’s sweet little laughs, of course! With the Safari Beats musical toy by Bright Starts, there will be plenty of giggles to go around. 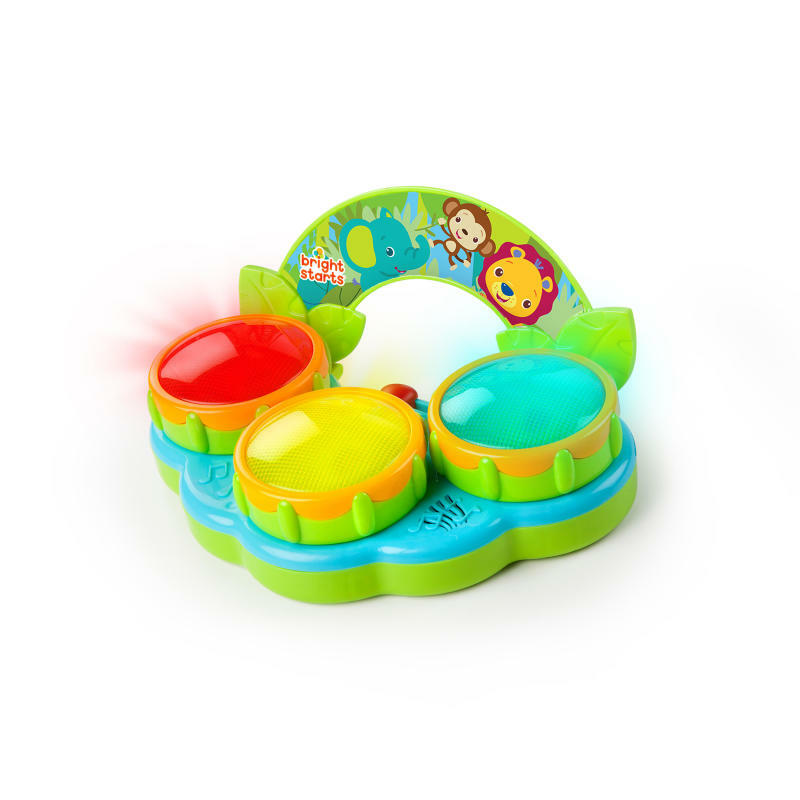 Every push of a brightly colored button will send your little one bouncing to the beat. Switch it up from drum mode to melody mode and discover a whole new safari of sounds. The easy-to-grip handle means your little party animal can monkey around all over town, sharing silly tunes everywhere she goes. But whether she’s tap-tap-tapping along to her drum or singing sweet songs, she’ll put on a wild concert you won’t want to miss. Dimension (in) 9.5" x 6" x 4.6"
Rated 2 out of 5 by Apot from Sounds stopped working My son LOVED this until the sound stopped working. Tried changing the batteries and nothing worked. It still lights up, but no sound. Very disappointing! Rated 1 out of 5 by toyreviewer from Stopped working This toy lasted less than one month. Even with replacing the batteries twice the toy did not work for more than a couple days and then would turn into this terrible static noise with only one drum lighting up and getting stuck. Rated 1 out of 5 by Frances1617 from Sound stopped working in less than a month. I bought this for my baby, and I loved it while it worked. About a month and a half later, only the lights worked, I assumed it was the batteries, but only the lights kept working with no sound. I was totally bummed about this. Have never had any problems with all the other toys we have of this brand. Extremely dissapointed. Rated 2 out of 5 by Jfidler from No noise My baby loved his drum set and all a sudden 4 months later it only lights up ko noise or nothing. Rated 3 out of 5 by CsMom from Great toy with vet short life span I bought this toy for our son just before he turned 5 months old. He LOVES this thing which is why it is getting a 3 star rating. Unfortunately by the time he was 8 months old the drum instead of playing music plays a combination of just the most awful, nails on a chalk board, static.